Before you purchase a scooter, it is necessary that you read our electric scooter reviews that will give you ideas which scooters are the best in the market. Electric scooters have become a huge success since its launch and this is because of a number of reasons discussed later on. If you are among those people intrigued by it and currently in limbo whether to buy one or not, let this article serve as your guide in making a sound decision. We’ll cover electric scooters for kids and adults along with how fast they go. With recent advancements, some of these scooters and go over 20 mph! You really want to know the limits of each so you don’t get a scooter that is more powerful than your children can handle. If your an adult you definitely don’t want a weak scooter and you want one that can handle the weight of an adult. Without further a do let’s check out a list below. Razor E 125 Electric Scooter is an entry level scooter from Razor, a giant scooter manufacturer. It’s suitable for kids aged eight years and above. It has a powerful electric engine that gives it a maximum speed of 10 miles per hour. When fully charged, this ride can take you for a cruise around your neighborhood for about 40 minutes. Unlike a few advanced models with more power, the razor E125 may need a little kick to get started up 3mph before they get moving. Once energized, they flare up the speed up to 10 mph. The speed is fast enough but safe to get the kid where he/she is going. The twist grip throttle helps the child get the scooter moving. Above all, the folding mechanism handlebar makes the scooter easy to store and transport. Despite a few downsides like run-time variation according to maintenance, riding conditions and climate, Razor E 125 Electric Scooter is still a good economical purchase. Razor Pocket Mod Miniature Euro Electric Scooter is one of the hottest scooters with a vintage look that is sure to turn heads wherever you go. Its high torque drive train capability makes its engine powerful enough to start it from a standpoint. Razor Pocket is a true definition of style and comfort. It has a seat and steel frame to give your kid’s legs a place to rest as he/she cruises around the neighborhoods. The handlebars have a plastic casing with treads to provide a firmer grip. The tires are large and made from the pneumatic technology thus providing a smoother and comfortable ride. Razor Pocket Mod Electric Scooter has received numerous positive reviews for being an exceptionally beautiful scooter. Teen Vogue, Time and Newsweek have consistently praised it for its performance and the classic Italian design. Razor pocket comes with a storage compartment for easy storage. Built in battery that can take it for a 10 mile spin on a single charge. Maximum Weight Supported: 170 pounds. Razor E200 has much-advanced features than E100, 125 and other models like Trikke E2. Its high torque chain driven ability gives it a maximum speed of 12mph making it suitable for those aged 11 years and above. When fully charged, this motor can take you for a spin for an hour before it needs to be recharged. The full-sized deck and frame on E200 make it perfect for heavier teenagers. The 8-inch pneumatic tires offer better traction than the urethane models. This feature also adds to the efficiency of this scooter in supporting loads of up to 69 kgs. The tires, however, are only suitable on a flat paved terrain. Razor E 200 has enough power to get it started from a stationary point. No need to give it a nudge like E 100. It runs smoothly without disturbing neighbors or making the dogs bark everywhere it passes. It’s speed is regulated by the single speed twist-grip throttle. To stop it, you need to use the hand-operated rear brake. The absence of a seat on E 200 has been catered for by the large deck and frame that you can stand on while riding. You can go for E 200 S if you need one with a seat. Supports weight of up to 160 pounds. Takes 12 hours to charge fully. Black Super Turbo 1000watt and 800 watts Elite 36v Electric Scooters fly like rockets. At 26miles per hour, this Porsche scooters will make any scooter enthusiast go nuts. Their perfect design and control mechanism make them suitable offerings for speed freaks. Black Super Turbo 1000watt is an upgrade of the 800-watt model, and it’s more durable. It’s equipped with heavy duty sprockets and chain for effective performance on the road. Black Super Turbo 1000watt scooter was designed purposely for speed, durability, quality, and efficiency. That explains why it’s considered a top notch scooter for a comfortable and smooth ride. Black Super Turbo 1000watt design and functionally makes it suitable for both kids and adults. At 26 miles per hour and a 36 v battery, this beast can take you to work and save from the frequent fuel budgets. If you are buying it for kids, you might want to warn them not to ride it at maximum speed for their safety. If you prefer standing, the seat on Black Super scooter is removable. Get it off and enjoy your ride while standing. Can be driven in two modes: Turbo mode (you go faster but the distance covered will be short) and Econo mode (you go at a slow speed but cover a longer distance). Razor E100 Glow Electric scooter is low end super quiet product from Razor manufacturers. Its structure including the deck and frame are designed for kids use only. Its high torque chain driven ability provides enough power to speed this blue-streaked motor up to a maximum speed of 10mph. The speed is perfectly safe for kids aged 8 and above. When fully charged, Razor E100 Glow Electric can provide your child with up to 4o minutes of fun time. The 8-inch pneumatic tire makes this scooter provide a premium level comfort to the kids. One twist of the handle will make the blue lights to go on and make the kid visible during evening and late night rides. Besides being a lower end scooter, you still need to instruct the kid about the safety measures to be followed for a safe and fun spin time. Razor E 300 S is one of the best medium level scooters from Razor manufacturers. It has many fascinating features that provide kids with loads of fun. Its high torque, chain driven ability makes it powerful to move at a maximum speed of 15 mph. Unlike the lower end Razor scooters that need a manual push before the can start, Razor E 200S powers itself from its standing. The front tire is made from pneumatic technology thus providing a smooth and comfortable ride. Its ultra-quiet movement is also highly cherished. To enjoy 40 minutes of an undisturbed ride, this scooter needs to be charged for about 12 hours. 40 minutes of run time when continuously used. If you are not sure whether your kid likes scooters as a hobby, you can buy him/her Razor E90 Electric Scooter. It’s a good one to get your child started. Despite being a budget buy, this scooter can keep your child entertained for many years. To keep your child safe, E 90 has a wide deck to make sure the legs get enough space. The maximum speed this scooter can go at is 9mph. Unlike most scooters which are made with pneumatic tires, this one comes with urethane tires which are puncture proof thus adding an element of safety to its use. EcoReco M5 E-Scooter slim built makes it a perfect scooter for skipping taxi lines and finding your way past a tight traffic. It’s a suitable motor made for individuals who live in busy urban areas. The frames are made from high-quality aluminum thus supporting more weight than most scooters. Its deck is spacious enough to allow both your feet to rest on it. To start it, EcoReco M5 E-Scooter needs a slight push until its speed reaches 2+ miles per hour to fire itself up. One of the pros that make this scooter better than most is its short charge time duration. It’s portable and can be folded to occupy a small space. Scooters offer loads of fun to both kids and adults. Besides that, some adults use them to go to work when they want to cut on fuel expenses. Sometimes when the car fails to start, and you are late for work, a scooter will come to your rescue. You will be able to dodge through the long tail traffic and arrive at your place of work on time. For kids, scooters will help them exercise their bodies as they run around their neighborhoods. Most scooters have been designed with safety features, but parents need to ensure their kids put on safety gears like helmets and kneepads. Electric scooters are easy to maintain compared to other forms of transportation. They use battery for power instead of gas, allowing you to save a ton of cash because you no longer have to set aside money for gas. The electric scooters are definitely eco-friendly. They do not emit harmful smoke that may threaten the environment. There are electric scooters that may be used by kids and adults. 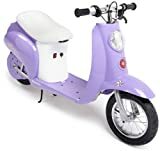 If you wish to buy a scooter for your kids as gifts, these will certainly make them happy because they can now roam around the neighborhood with their friends. These scooters will also give you peace of mind as they are safe and not harmful to your kids’ health as long as you know where they are going and they practice safe driving. If you want to buy an electric scooter for your own consumption, this can be a very economical and a useful ride for you and anyone in your family. You can use electric scooters not just for having fun with family but also for running errands at home. They can be very handy in traveling from one place to another, especially at short distances. These are reviews are helpful especially for people having a hard time choosing the best model for a scooter. There are many factors to be considered because electric scooters do not come cheap. Since you will be paying for it with your hard-earned money, might as well go for one that is worth your every cent. In purchasing any item, the top priority must always be its quality because no matter how affordable it is, buying one becomes a total waste of money if it easily breaks or malfunctions. Before letting go of your hard-earned savings, you may want to conduct research about the features of the electric scooters and always read testimonials of the current users to give you a sneak peek if the product you’re looking at for a good buy. If you are buying a scooter for an eleven-year-old kid or someone who cherishes the surge of an adrenaline rush, try to get them one that can go really fast. Most non-professional scooters have a speed of about 15miles per hour; that should meet the needs of your speed freak champ. If you kids are below the age of eleven or have less experience with these motors, get them those go at a slower speed-something like 9 or 10 miles per hour. 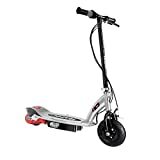 There are affordable electric scooters while there are some with prices at skyrocket. However, the most expensive model does not always guarantee that it is the best in every aspect, so take your time in scouting for other brands and models to ensure you will bring home a good deal. Safety should come first whenever you are buying an electric scooter for your child. First, you need to ensure they put on safety gears like kneepads and helmets. 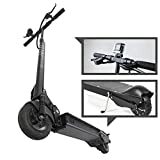 The scooter itself should be easy to use with hand operated rear brakes, appropriately sized tires, a twist grip throttle and retractable kickstand for easy storage and safe riding. Before buying an electric scooter, get to know its features and consider whether or not it will cater to you and your kid’s needs. You have to take note of its maximum speed, battery life, handling, brakes, height, storage requirements, and warranties. There are shoddy manufacturers everywhere, and that means you need to investigate a product thoroughly for durability before buying. If you don’t have the time, then just buy a scooter from renowned brands like Razor. Such products are made from steel and have long lasting batteries when charged properly. The overall performance and likeability of an electric scooter can come down to its design. Does the scooter come with a deck and frame for additional balance? Does it need a dual platform? What’s the minimum age requirement? Will it suit my child’s weight? Such are the questions you need to address before you carry the scooter home with you. The battery life of a scooter is directly proportional to the fun time you’ll have. A bad battery? Less fun. 10 minutes of ride after charging for 12 hours? Even worse. Read the label on the scooter and find out how long it lasts before buying. You may have seen your neighbor or their kid scoot across your home, or even watched videos of professional scooters in action and wondered how they do it. If you’re enthusiastic to know how to go about it, the following steps will help you out. Push yourself forward with the foot on the ground. Once you’ve gained some speed, try to bring the other foot on the deck. When in need of breaking, use the leg that you used to push yourself forward and press it on the break until you reduce your speed to the needed level. Rotate the handlebar slowly when turning to avoid losing balance. Keep practicing- it’s the only road to perfection. Hopefully you have a better idea on what would be the best electric scooter for your kid or yourself. There are a lot of great options to choose from that you can choose from that range from various maximum mph and various weight limits. So, make sure you buy the scooter that is going to go as fast as you like and also will be the correct weight limit. Hit us up with any questions you might have about the various models. http://www.electricscooterreviewshub.com is a participant in the Amazon Services LLC Associates Program an affiliate advertising program designed to provide a means for sites to earn advertising fees by advertising and linking to amazon.com.